Home / GER/DEN 2019 / Denmark and Sweden one step closer to Hamburg! 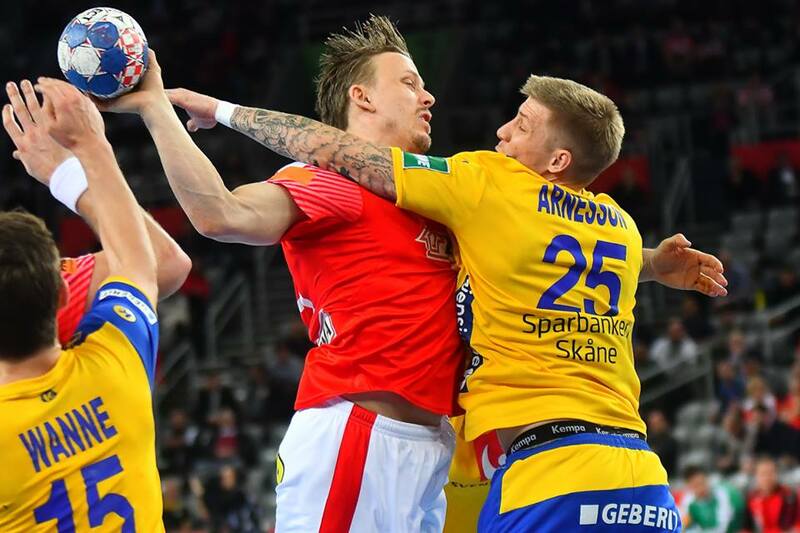 Denmark and Sweden came to the edge of the final weeekend after secure wins at the start of the Main Round in Herning at World Championship 2019. Denmark: Mikkel Hansen 7, Anders Zachariassen 4, Rasmus Lauge 4, Lasse Svan 3, Magnus Landin 2, Mads Mensah 2, Simon Hald 2, Casper Mortensen 1. Hungary: Zoltan Szita 5, Adam Juhasz 4, Bendeguz Book 3, Peter Hornyak 3, Patrik Ligetvari 2, Laszlo Nagy 2, Dominik Mathe 2, Bence Banhidi 1. Sweden had no difficulties to put Tunisia down 35:23 (19:14). Tunisia: Mosbah Sanai 6, Mohamed Soussi 3, Morouan Chouiref 3, Oussama Hosni 2, Oussama Boughanmi 2, Rafik Bacha 2, Ramzi Majdoui 1, Camel Alouini 1, Yousef Maaref 1, Johed Jeballah 1, Anouar Ben 1. Sweden: Niclas Ekberg 7, Simon Jeppsson 4, Kim Andersson 4, Albin Lagergren 3, Linus Arnesson 3, Mattias Zachrisson 2, Kim Ekdahl 2, Max Darj 1, Jerry Tollbring 1, Hampus Wanne 1. Question about Magnus Abelvik Rod appearance at final: He will do the test before the match!